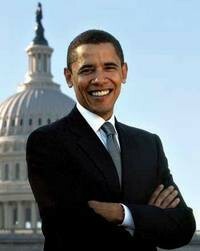 NORWICH — It may seem early in the game to start thinking about a presidential frontrunner, but if campaign donations, voter polls and local legislators’ praise are any indication of the future, Barack Obama (D-IL) is Vermont’s man in the Democratic primary race. Last Sunday, in a hush-hush visit to the Green Mountain State, Obama addressed a crowd of about 200 supporters in a tent outside the stately Norwich mansion of Bill and Jane Stetson. The senator’s appearance, which marks the first to Vermont by a declared, mainstream 2008 presidential candidate, is likely the swankiest local fundraiser since former state Governor Howard Dean’s failed 2004 White House run. Obama’s take from the gala exceeded the original goal of $250,000 “considerably,” says Bill Stetson. When heaped atop the $121,779 the senator had already raised in the state, Sunday’s earnings catapult his Vermont fundraising campaign well beyond the competition. According to July figures from the Washington, D.C.-based Center for Responsive Politics (CRP), Senator Hillary Clinton (D-NY) is a distant second with21,150 Green Mountain greenbacks. Further bolstering his place in Vermont presidential politics, Obama beat out Senator John Edwards (D-NC) as the most popular Democratic candidate in a poll of about 800 Vermonters conducted by the state Democratic Party earlier this month. Obama took 36 percent of the vote; Edwards trailed with 29 percent, and Clinton took 10. “It was a remarkably hopeful and exciting presentation with good humor and a great urgency to make a difference in how we treat our people . . . and other countries,” said East Barnard resident Jenepher Linglebach, who attended Sunday’s speech. She suggested the speech incorporated a good “mix” of foreign and domestic policy discussion. “He’s one of us,” added her friend Titia Ellis of Woodstock as they stepped into a Toyota Prius. At $1000 per plate and $2300 for a photograph with Obama, it’s no surprise the event drew participants from Vermont’s upper crust. But party co-host Jane Watson Stetson, who serves on the finance committee of the Obama campaign, says she would dismiss claims the senator’s campaign was exclusive. She and her husband, a filmmaker and environmental consultant, point out that despite its high entrance fee, the event generated thousands in “low volume” donations. Watson Stetson adds that she views Obama as an “inclusive” candidate. Statistics offer a more complex assessment. According to July figures from the CRP, only 28 percent of Obama’s total donations for his presidential campaign have come in installments of $200 or less, a figure that doesn’t include Political Action Committee (PAC) donations from entities such as corporations or labor unions. Edwards clocked in at 23 percent on this measure, Clinton at 9. Ohio Rep. Dennis Kucinich, whose policies are more progressive than those of the major three candidates, boasted 73 percent. On the other end of the financial spectrum, Obama was second only to Clinton for donations of $2300 or more, receiving 44 percent of his funding in these large installments. Clinton reported 70 percent, Edwards 42 and Kucinich just 6. After Obama’s departure from Norwich, guests lingered into the evening with freshman Congressman Welch. How does Obama compare with the last Democratic candidate to cause a major stir in Vermont, Howard Dean? Welch, who was serving as Vermont Senate Pro Tempore when Dean made his presidential run in 2004, likened both candidates to “insurgents,” adding that Senator Obama doesn’t suffer from the “burden” of being relatively unknown in the national spotlight. Prompted by Senator Leahy’s claim that Obama’s position on the Iraq war is “consistent” with that of Vermont’s congressional delegation, Seven Days compared Obama’s Iraq war voting record with those of Leahy and Bernie Sanders. Obama’s votes were also compared with Vermont Congressman Peter Welch’s where applicable. • Out of 13 votes Obama has shared with Leahy in 2006 and 2007, the senators agreed on all but one: the failed Troop Redeployment Amendment. On six war-related votes Obama shared with Sanders, the two senators voted identically. • In June 2006, Obama voted against the Troop Redeployment Amendment, which would have set a firm deadline for troop withdrawal from Iraq. Leahy and Obama’s senior Illinois colleague Durbin voted for the deadline. That vote occurred before Sanders and Welch had taken office. • In January, Obama introduced the Iraq War De-Escalation Act of 2007. His cosponsors were Durbin, Leahy and Sanders. The bill was referred to the Senate Committee on Foreign Relations. Welch cosponsored a similar bill in the House. • Last month, Obama, Durbin, Leahy and Sanders supported two amendments to the 2008 Defense Authorization Act. The first would have set restrictions on the deployment of American soldiers to Iraq. The second would have provided for a “reduction and transition” of American forces in Iraq. Both amendments gained a slight majority, but not enough for a 60 percent majority. Welch supports similar legislation in the House.